Selling at JBF is as easy as 1-2-3! Mid-Missouri Families that sold with us in the fall earned on average $280, and so can YOU! 2. Prep and tag your items at home. 3. Drop your items off at the event. Consignors earn 60% on all their sold items. Consignors who help at the event earn 70% on their sold items. There is a consignor fee which is deducted from your check at the end of the sale. Register to be a Consignor Today! Be a part of the JBF Community and make YOUR sales event great! The online volunteer schedule will be open SOON! Volunteers who complete a total of at least 4 hours earn 70% on their sold items. Volunteers receive exclusive opportunities to shop presale on Thursday before we open to the public and then again Friday evening before the Half-Price sale! We have TWO drop off times to make it as easy and convenient for you as possible! 1. Prep, price and organize your stuff at home (see details below) and bring to the Elks Lodge. 3. Park at the South side of the building and come in through the doors with the JBF sign. 4. Check in with Casey inside. 5. Find a rolling rack or bin and unload your items from your car. Come back inside and wait for your items to be inspected before putting out on the floor. 6. After inspection, place your items out on the sales floor in the appropriate areas. They will be marked clearly and volunteers will be able to help direct you. Plan 60-90min for drop off depending on how many items you have. Find more items to sell? Come back Thursday morning by 10 am and still make the sale! Pick up will be from 2-4 p.m. on Sunday, March 17. After 4:01 p.m., remaining items are donated to charity. Sorry, no exceptions! We accept boys and girls clothes, infant to size 18/20 and girls juniors clothing. All clothing must be hung on hangers. We will have smaller areas for onesies, pajamas, socks, hats, scarves, tights, and other accessories that do not need to be hung. We cannot accept clothing that have any stains, rips, tears, missing buttons, or noticeable wear. We also cannot accept children's clothing with drawstrings. Recommended minimum clothing price of $3. If something should be priced less than $3, it is a good idea to group the item together with another one or two items to create a lot that can be priced higher. **For the fall sale, we will not accept shorts or swimwear. Baby equipment such as: excersaucers, high chairs, bouncy seats, bumbo chairs, strollers, pack n plays, swings, etc. baby/children's furniture such as: cribs, toddler beds, changing tables, dressers, etc. All items must be checked for safety and recall. If item has multiple pieces use packaging tape, zip-ties, or string to keep items attached together. If wooden furniture has loose parts, use clear plastic wrap to secure item. All furniture and equipment must be assembled during the sale. Please bring a Car Seat Checklist for all car seats, booster seats, and car seat base or infant carrier. Attach JBF tag directly to item with clear packaging tape or hole-punch JBF tag and tie it to item. All toys must be checked for safety recalls (see below) before consigning. Clean all toys and baby equipment thoroughly. We cannot accept toys or equipment which are not clean and functional. Please test to make sure that toys and equipment are working properly. Battery operated toys must include working batteries -This is mandatory. If your toy comes to the register and it does not work, we will put new batteries in it and charge you $1 per battery. Keeping tags and multiple items attached is essential for your items to sell. Bag all small parts belonging to toys/equipment in self-seal bags and tape the bag shut with clear packing tape. Fasten the bag securely to the item with ribbon, tape, or zip ties. Items must include ALL working parts. Price 50% - 90% off retail. - Price your toys appropriately. You want them to sell and go to good home. 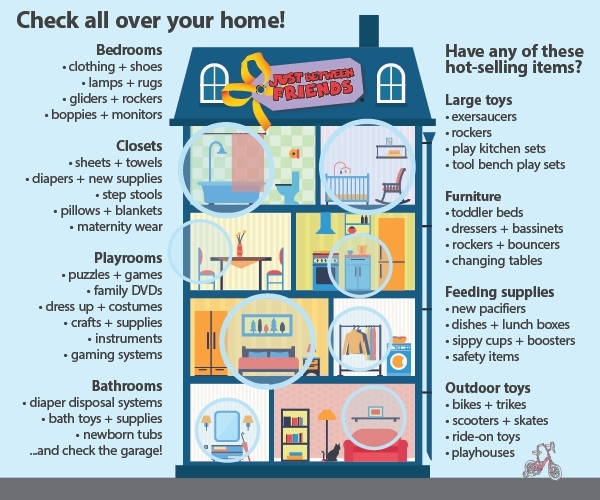 Household items that other families will use (no nick nacks please). You may consign storage solutions (baskets, bin, shelving), furniture (no upholstered items), decor (lamps, wall hangings, no antiques), craft items, and kitchen items (small appliances, utensils, etc.). PLEASE NOTE: For this category this is No Donation Option: unsold Mommy Mart items must be picked up by the Consignor after the sale. We are not able to donate these items after the sale. If selling multiple pieces together, be sure that all pieces are secured together. Price to sell! These items are not the primary reason shoppers come to JBF, so the price low! Secure the tag to the item to ensure that the tag does not fall off during the sale and so that item is not damaged when the tag is removed after purchase. Nursing covers & pillows, feeding items, monitors, safety items, diapering & toileting items, rattles, and more. Please check for safety recalls (see below) on all items that you consign. If item has multiple pieces use packaging tape, safety pins or clear self-seal bags to keep items attached together and clearly visible to shoppers. Attach JBF tag directly to item or clear self-seal bag with clear packaging tape or hole-punch JBF tag and tie it to item. Drop off your clothing items as well as other "stuff" like toys, baby gear, games, books, puzzles and whatever else you can find for your tagger. Review our Tips & Reminders for easy drop off. Provide the completed waiver to your tagger. Your tagger will prep, price and tag your items. JBF will store and place the items on to the sales floor as well. Pick up of unsold items is the responsibility of each consignor. Valet Consignors earn 45% of the sale price of your items less a $20 supply/consignor fee. If you help at the event for at least one 4-hour shift, you will earn an additional 5% less the same $20 fee. We'll also give you presale passes for you and 2 guests which will be held at the door with our greeter or emailed to you a week prior to the sale. Need space or money now and can't wait for the sale? We have another option for YOU! Read on regarding our JBF On Demand program. If you have items you would like to clear out of your home, but need them gone now, email us! We purchase children's and maternity items at any time of the year. Purchase prices will be at garage sale prices. There are many ways to shop early and get the best deals! See our Shopping Details page to learn more. Hi! Welcome to Just Between Friends Columbia! We are Casey Elliott and Nichole Clark and we love working hard to organize these Just Between Friends events for Mid-Missouri! We LOVE the thrill of the hunt for good deals. 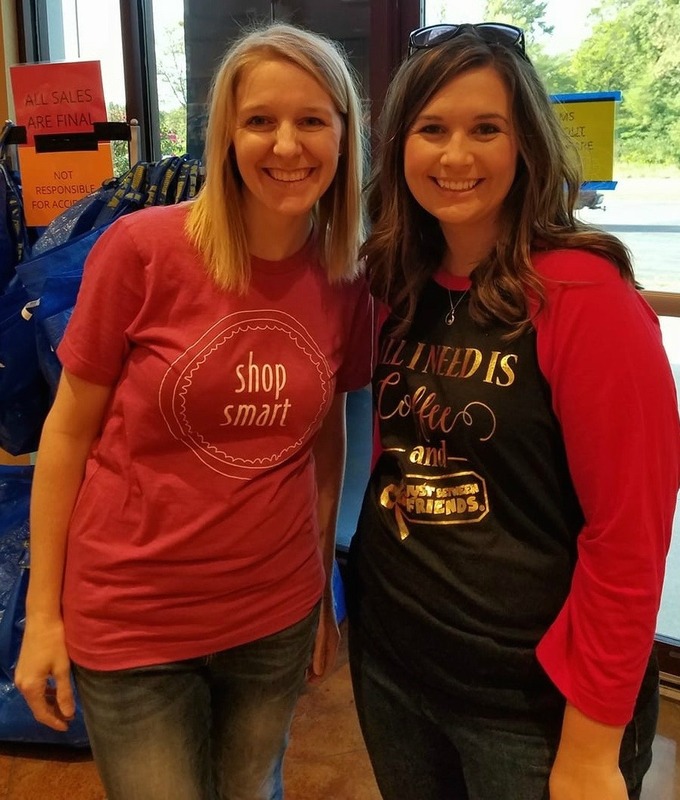 We are honored to provide a space for area families to do MAKE money and SAVE money by selling and shopping with Just Between Friends, Columbia! Casey is a mom to 3 children, 5 year old twins a boy and a girl, and a 2 year old little girl. Nichole has an 9 year old boy and a 5 year old girl at home. We know how expensive providing for children can be!